The genus Stephanotis includes around 15 perennial climbing leafy vines with smooth ovate leaves, from tropical and subtropical climates. Flowers are heavily scented. Members of this genus occur in China, Japan and Malaysia, Madagascar and the Caribbean. 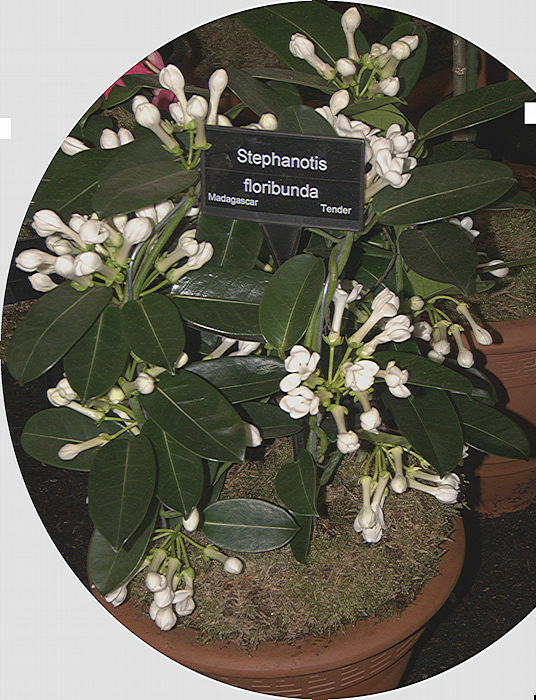 Thye best-known species is Stephanotis floribunda which is widely cultivated for use in floristry e.g. wedding bouquets and as a house plant. This climbing plant has long climbing stems with opposite pairs of glossy dark green leaves. Older stems become woody. The fragrant waxy white flowers have a long flower tube ending in a 5-pointed star of spread flower lobes. Native to Madagascar. Suitable for a frost-free (45 °F) conservatory or greenhouse, although it prefers a warmer 60 °F Winter. A cool Winter is said to promote flowering.